Back in March I reviewed Christopher Hoare's newest novel, Arrival. On Aug 15th, the novel was announced as a science fiction finalist for the 9th Annual Dream Realm Awards. Here's the link to the full listing of winners. Falling in love is a difficult process to describe, can take many forms, and often doesn't happen when one expects it. Love is also more than just a feeling between two people and it seems hard to know whether to follow what is in your heart or what is in your head. The Road Not Taken is a romantic adventure story about how two individuals find answers to tough questions. An impossible partnership at the start, Maggie and Emeka find their hearts wrapped together and see a future together, until a past love surfaces. Emeka struggles between his love for two women, but eventually makes the tough choice. Maggie is overwhelmed with emotions, but chooses the road that is right for her. 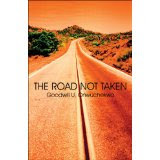 Goowill Onwuchekwa's descriptive voice brings the reader into the action. He uses multiple senses in each scene to give the reader a feeling of watching a movie instead of reading text on a page. His characters are intelligent and emotional. The characters are multilayered, intersting, and unpredictable. It is great storytelling with tight prose. Goodwill U. Onwuchekwa was educated at the Teacher's College, Azaraegbelu, in Imo State, Nigeria. He taught as a grade II teacher, and later read law at the University of Nigeria, Nsukka and the Nigerian Law School, Lagos. This is his first novel. The Road Not Taken is a great read for anyone who enjoys well-written prose.